"I think the US and EU position is to recognise [Juan] Guaido as interim president but to call for new presidential elections. So they are not simply replacing [Nicolas] Maduro with Guaido", Ambassador Paul Webster Hare, a British diplomat for 30 years and the British ambassador to Cuba (2001-2004) told Sputnik. On 31 January, European Parliament (EP) recognised Guaido "as the only legitimate interim president of the country" with 439 votes to 104 and 88 abstentions. 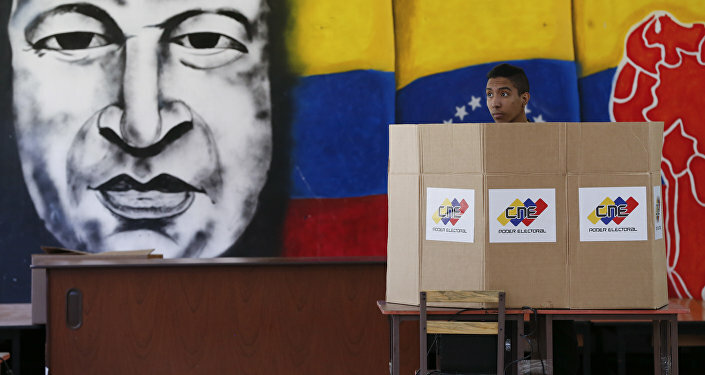 The EP resolution called upon Caracas to hold repeated presidential elections "in order to restore democracy". The move was followed by a joint declaration signed by 19 EU states that "acknowledges and support" Guaido as "president ad interim of Venezuela". Earlier, France, Germany and Spain gave Nicolas Maduro an ultimatum until 3 February urging him to announce a new presidential vote within eight days. The legitimately elected Venezuelan head rejected the ultimatum. Russia, China, Cuba, Mexico, Nicaragua and many other countries have signalled their support for Maduro. The growing controversy raises questions about Venezuela's international posture amid the unfolding crisis. "Guaido's priority is not to set a new foreign policy", the ambassador pointed out. "That will evolve after elections. One must hope that Maduro does not imprison him like other opposition politicians, such as Leopoldo Lopez". Paul Webster Hare, who now teaches international relations at Boston University, placed emphasis on Caracas' financial issues, drawing parallels between the situations in Venezuela and Cuba. "The real crisis is happening for the Venezuelan people with rampant inflation etc. and the migration exodus affecting neighbouring countries. I don't think Russia and Cuba is the prime focus", he said. "Cuba has had extremely close links with and influence in Venezuela, primarily since 2002", the diplomat continued. "Cubans are however not suffering the desperate situation of Venezuelans. Equally, it is not clear that Brazil, Argentina and Colombia, let alone the EU and Canada, would support a drive for regime change in Cuba". According to Paul Webster Hare, the ongoing controversy is not evolving around Venezuela's rich oil reserves, but the looming economic collapse, which could be prevented by an international action. "The issue is not oil reserves, though Russia has done some negotiations for concessions in Venezuela", he said. "The United States is itself now a major oil and gas exporter, so that is not a major consideration. Many countries' oil companies would like to work in Venezuela again once stability is restored". He noted that "all countries, including Russia and China, recognise that Venezuela's economic collapse must be remedied and it will require international action and dialogue to promote a new start". Washington is concerned about Venezuela maintaining close ties with Cuba and Russia. Speaking to Fox Business, State Secretary Mike Pompeo expressed hope that following the "peaceful transition" of power in the republic, the Venezuelan people will be "independent, not relying on Cubans and Russians for their security or their well-being". Havana and Caracas established a major partnership 1999 under then President of Venezuela Hugo Chavez and his Cuban counterpart Fidel Castro. Chavez also facilitated Russo-Venezuelan rapprochement in the early 2000s. Following Washington's recognition of Guaido, the US Treasury introduced sanctions against Venezuela's state-owned energy company PDVSA on 28 January and passed control over some of its foreign funds held by US banks to the self-proclaimed interim president. Commenting on the move during the White House briefing, Treasury Secretary Steven Mnuchin highlighted that "[t]he path to sanctions relief for PDVSA is through the expeditious transfer of control to the interim president or a subsequent democratically elected government who is committed to taking concrete and meaningful actions to combat corruption". On 6 February, Reuters wrote that the Venezuelan opposition would be receiving money from a US fund to bank the country's oil income, citing opposition lawmaker Carlos Paparoni. Meanwhile, the Venezuelan political crisis has prompted disagreements in the US Congress. As Bloomberg reported on 7 February, the Senate Foreign Relations Committee failed to reach compromise on the resolution recognising Guaido, despite bipartisan support of the move. Some US senators believe that the resolution "might be interpreted to be an authorization of the use of military force".